Weather Modification, Inc. Environmental Monitoring - Weather Modification, Inc. Whether you need to document the character of clouds or variations in visibility, we have the knowledge you require, the instrumentation you need and the means to deploy it. Weather Modification, Inc., conducts atmospheric environmental monitoring programs of any scale. 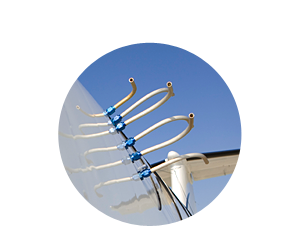 We are well-known for airborne measurements but we offer ground-based systems as well. We also provide sensors to detect a variety of atmospheric trace gases important to environmental quality, including ozone (O3), carbon dioxide CO2, carbon monoxide (CO), and sulfurous and nitrous oxides (SOx, NOx). To document the movement and dispersion of aerosols in the atmosphere, we offer tracer technologies that enable you to release and track a variety of materials to considerable distances downwind. If the terrain is complex, we can provide numerical models to gain understanding of locally specific transport and dispersion.